Illustration from the Bandha Yoga site: those pale lilac fingers are the serrated edges of serratus anterior. On the day my yoga life officially began, sometime in June, 1987, I took a private class from Wende Davis. She taught me spinal stretch, with my hands resting on her upright piano. Then she tapped her fingers along my spine and asked me to notice the different qualities of the flesh. My lumbar spine was lively and soft, but my upper back felt like wood, a solid lump that I couldn’t move, and in fact, couldn’t even feel from the inside. I was not, by the way, at all unusual in this, just early. The deadness in my upper back was the result of extra rounding, or hyper-kyphosis, something that happens to almost all of us as we age, women especially, but men too. The most rapid rounding usually comes between ages 50 and 60. Since that day I have done yoga chest openers, and many of them. I have tried, with varying degrees of success, to stay conscious of my upper back in every forward bend, every standing pose, every twist, and every back bend. Naturally, my back has improved with practice. Twenty-five years later, my spine is significantly less rounded and more mobile. But I’ve never felt quite free from the prison of my rounded upper ribcage, at least until now. It happened in a Google moment. Searching for some help with my nemesis pose, chaturanga dandasana, the yoga push up, I clicked onto the Bandha Yoga website. Bandha Yoga is an anatomy driven site written by Ray Long, an orthopedic surgeon and long-time yoga student who has studied extensively with BKS Iyengar and other leading teachers. Chris MacIver does the phenomenal anatomical illustrations, on the site and in the Bandha Yoga books. I found myself looking at an explanation of how to activate serratus anterior, the muscle that rises up out of your ribs and attaches itself to the whole front surface of your shoulder blade. Rounding the upper back and lifting the shoulders, as we do when we work at computers, or drive, cook, garden or do almost any forward-oriented task, leaves this muscle slack and unused. 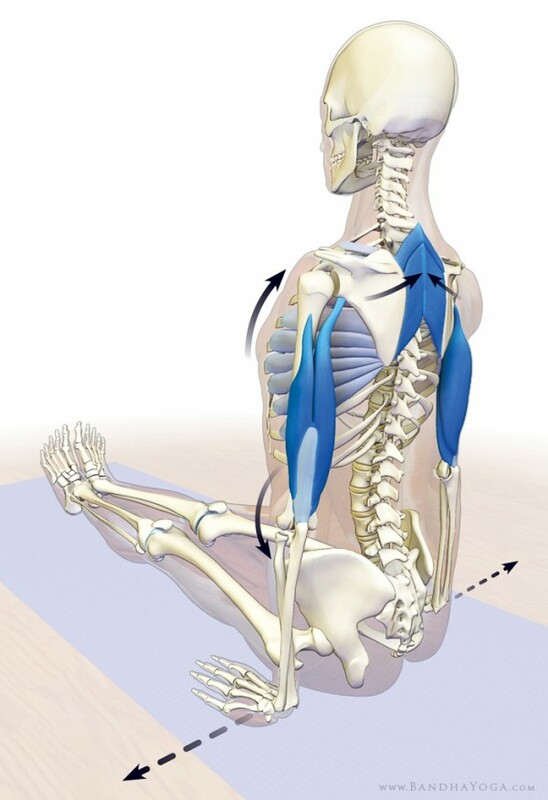 On the Daily Bandha blog, Long and MacIver illustrated the action in staff pose, the seated equivalent of mountain, which is to say, as simple as it gets. Activate your legs: skin of the feet spreading, heels stretching away from the buttocks, front thighs lifting, thigh bones pressing down. With your arms straight, palms on the floor or bricks, fingers facing forward, draw your upper arm bones toward the wall behind you. This is a small action, the top of your arm bone moving a half inch or less toward the back of the shoulder socket. Then stretch your elbows toward the floor as you lift your chest. When all of that is in place, resist your palms out to the sides. By resist, I mean: don’t move your hands sideways; instead push out gently without moving. When it all works together, my front chest seems to rise on its own toward the base of my throat. Physically, it feels as though I’ve created more space in my upper chest, as though I’ve finally, at last, lengthened my thoracic curve as far as it was meant to go. At the same time, I have a sensation of having lifted myself into a clearer atmosphere, where I’m calmer, more balanced, and more aware of what surrounds me. Naturally, this action travels into other poses: arm balance, elbow balance, seated forward bends – any time the palms can be flat on the floor. Most wonderfully, the first time I pushed up into upward bow, set my upper arms and shoulder blades and then pressed my hands apart, I floated into an entirely different pose. Lifted and lengthened by serratus anterior drawing my shoulder blades into my back ribs, I briefly thought, “I’m not coming out, ever,” before, of course, coming out. In fact, once you’re used to feeling serratus anterior contract, it’s possible to sit in any meditation pose with your palms facing up or down, take your upper arms back, and your elbows down, then visualize resisting them apart, and get the lift. My ribcage? No longer locked, and what dwells inside feels like limitless space. It’s wonderful when something as seemingly simple as “sitting up straight” can activate such changes. I’m also trying the simple instructions while sitting at my desk. A timely reminder that I should do it at least once a day. Your cookies sound divine, Eve. Happy Christmas to you too, Jayne. I have no idea why holiday baking is so much fun for me – it just is. Hard to remember to stand up straight while making shortbreads though . . . . Upon reading your post, I immediately sat on the floor in Dandasana and tried it. You’re right, it does engage the serratus anterior. In my body, the palms action (statically pushing outward) really spread my upper torso wide, from side to side. Thus I could lift my chest without excess forward-and-back movement. It also reminded me that yoga asana should expand the body in all directions. Up and down is often emphasized. Here, I felt both long and wide, as if being stretched vertically and horizontally. Thanks for the tip and the clear writing, Eve! I’m glad it worked for you. That same action continues to pop up for me in all kinds of surprising places – I’m beginning to think that my serratus anterior muscles have been asleep for most of my life. Nice to finally find a reliable way to get in touch with them. It’s an amazing view, isn’t it? Somehow the stripping away of everything except muscle and bone really helps me visualize how the muscles work. And at the same time, it’s very beautiful in its own austere way. Ah, Hélène, lucky you! Sounds wonderful. Previous post: Black sheep, white sheep, or just asleep?